For a limited time only, receive a FREE Makita Contractor Tool Bag, a Makita Multi-Tool, and a 5.5 inch White Lake Country CCS Polishing Pad! with your purchase! Retail value of $48.98! Enhanced user versatility for your unique polishing experience! Makita PO5000C 5” Dual Action Random Orbit Polisher is the long-awaited addition to the Makita tool line-up. Featuring Makita’s unique dual application design, Makita PO5000C is a random orbital polisher with both forced rotation capabilities as well as free rotation capabilities – it’s like having two powerful, paint correcting machines in one! 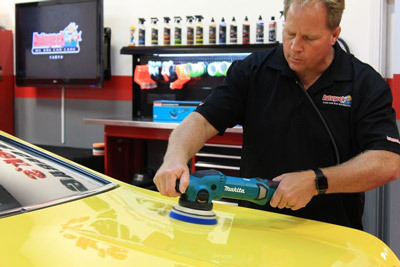 With enhanced features that promote a consistent performance job after job, Makita PO5000C 5” Dual Action Random Orbit Polisher performs admirably in both a commercial detail shop correcting and polishing several cars in a day, as well as at home in your garage. Order the Makita PO5000C Dual Action Random Orbit Polisher today – you don’t know what you’ve been missing! During testing, we also found the Makita PO5000C 5” Dual Action Random Orbit Polisher performs exceptionally well on vertical panels. Featuring several advanced attributes, Makita PO5000C was made with convenience in mind. Aside from the dual action control, Makita PO5000C has 5 speed settings so users are able to set the speed and action for their specific application. An automatic performance feature includes an electronic controller that automatically applies additional power to maintain constant speed, even under load. Makita PO5000C 5” Dual Action Random Orbit Polisher includes a “soft start” element for smoother start-ups and a longer gear life. Regardless of whether you are using the forced rotation setting, or the free rotation setting Makita PO5000C provides a smooth and consistent feel throughout the application. The 5.5mm orbit allows for perfect and complete defect removal without instilling any additional swirls or scratches. Designed for a comfortable grip, Makita PO5000C 5” Dual Action Random Orbit Polisher features an ergonomically designed knob handle in front, and an ergonomically correct, rubberized back handle. The lock-on switch is conveniently located right above your grip. Removable air vent intake covers help to prevent polish, dust, fibers from microfiber pads, and compound dust from collecting inside your motor and causing damage. 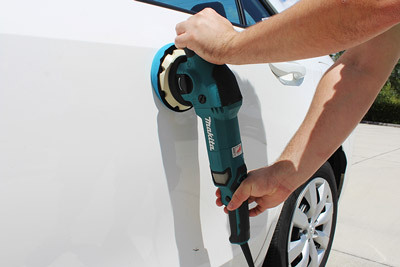 Another reason the Makita PO5000C was designed with detailers in mind? The power cord features a “cord guard” for increased flexibility (how many times do you adjust your cord during use? ), and a rubber tool rest on top of the machine for upside down placement of the tool. Makita PO5000C includes a 5 inch hook and loop backing plate compatible with all 5, 5.5, 6, and 6.5 inch pads. The 5.5mm orbit allows for perfect and complete defect removal without instilling any additional swirls or scratches.